If I say “D.O. Arribes“, what comes to mind? Most likely, very little, especially when considering that few Spaniards have even heard of this region. D.O Arribes is one of a handful of new D.O.s in the north central political region of Castilla y Leon, Spain, which has taken on a “quality wine region” status only in the last few years. And until I took a brief jaunt through this unbelievably beautiful wine region, did I actually give it the attention it so rightfully deserves. In total, there are 750 hectares of vines planted in D.O. Arribes, which spill across both the borders of Salamanca and Zamora provinces at altitudes between 150-700 meters. 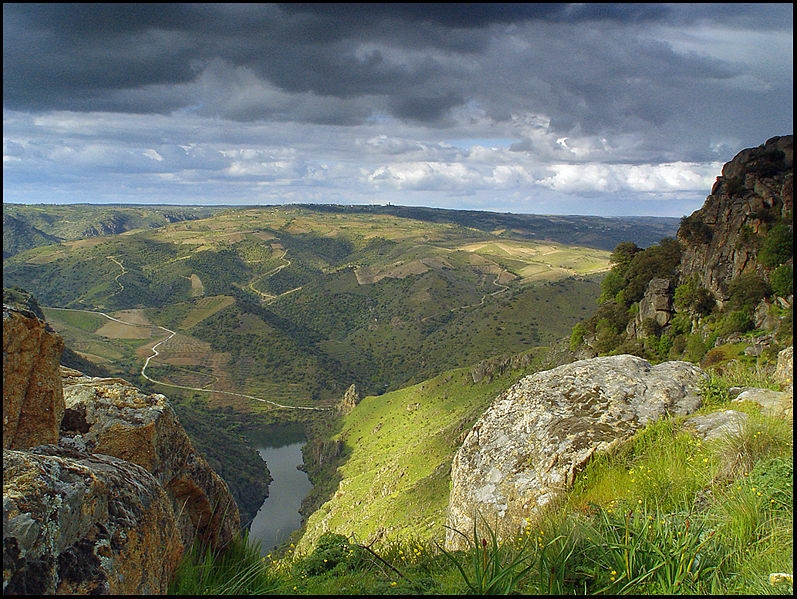 Here, the land defines itself by two very distinguishing factors: high flat ground and steep terraced land sweeping down into the majestic Duero and Tormes rivers. And interestingly enough, it was at the intersection of these two rivers where I had the opportunity to lay my hands on the powdery fine granite and quartz soils, inhaling the floral scent of blossoming almonds trees, in the 2,000 year old town of Formoselle, when I truly fell in the love with D.O. Arribes. Maybe it was the small stone walls sweeping across the region like a maze, some of which housed the sheep famous for the region’s elegant and soft artisanal cheeses that caught my heart, or even the old gnarly vines stretching across the miles upon miles of stark, infertile land. But more than likely, it was the passionate and devoted farmers and winemakers who have worked this soil for ages, believing in its potential as quality winemaking region, which truly made an impression on me. Like most of Castilla y Leon, D.O. Arribes has been known as a red wine producing area, championed by the indigenous grape to the medieval town of Fermoselle, Juan Garcia. Benefiting from smaller yields and modern winemaking practices, this grape generally produces young light reds that tend to take on a flavor profile truly unique onto themselves. Other principal red grapes include Rufete and Tempranillo – also called, Tinto Madrid and Tinta Serrana, while Garnacha, Mencia, Bruñal, Cabernet Sauvignon, Merlot, Malbec, Syrah and Bastardillo Chico are considered complementary grapes. Aging requirements for Crianza wines are 2 years with a minimum of 6 months in oak; Reserva wines are 2 years with a minimum of 1 year in oak; and Gran Reserva are 3 years with 2 years in oak. Rosados must be produced of at least 60% Tempranillo, Rufete and Juan Garcia grapes, with the remainder comprised of either white or red grapes authorized by the Denominacion de Origin. As for the whites of D.O. Arribes, they are absolutely worth your time. All wines must be produced with a minimum of 60% Malvasia, and may be blended with Verdejo, Albillo and Puesta en Cruz. For me, these wines tended to be fresh, crisp white wines with a lovely mineral and tropical fruit profile that provide the perfect accompaniment to the traditional foods of the region. This region also boasts of one of the largest protected parks in Europe called, Parque Natural Arribes del Duero, covering 191.255 hectares of land! And although I didn’t have the opportunity to explore this park, or every one of the 14 wine producers in the region, my curiosity has been sparked, and will hopefully inspire another trip in the near future!